This data is for MSL Year 2 Solar Longitude 151 to 270 (late winter to the end of spring). Updated 2/25/2016 after we caught the REMS Team/JPL dropping all low UV values for from the landing up through MSL Sol 1261. Their action was taken after they had reviewed our spreadsheets like that below, and our articles questioning low UV values on Mars. 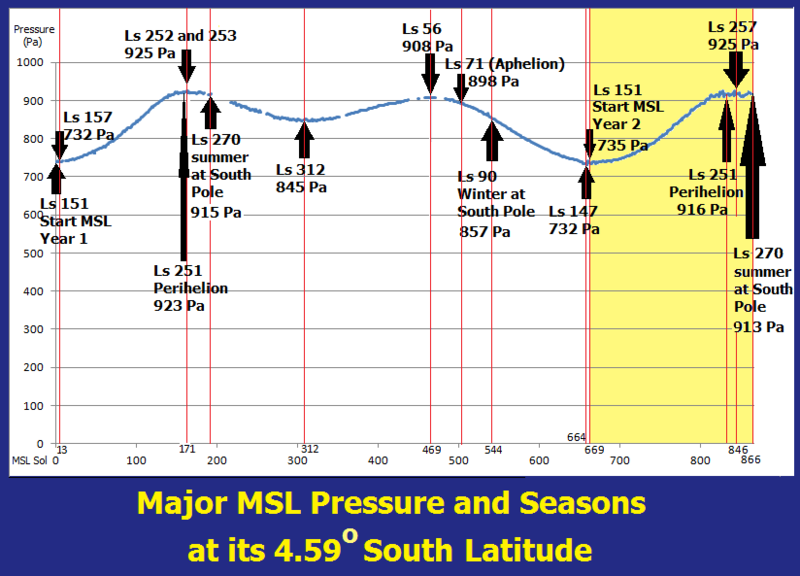 The pressure data for MSL's Year One plus Viking 1, Viking 2 and Phoenix is summarized on Figure 1. The full weather data for MSL Year One is HERE. Table 1 under Figure 1 sums up weather data so far for MSL Year 2. Note that MSL Year 1 and Year 2 both share a maximum pressure of 925 Pa. So far they also share a minimum pressure of 732 Pa. This MSL pressure chart, based on a lander close to the Martian equator (MSL is at 4.59° South), is especially of interest because Year 1 shows two pressure spikes that occur almost a half Martian year apart. The first spike is at MSL Sol 170 to 171 at Solar Longitude (Ls) 252. As just noted, the (revised) pressure published was 925 Pa. The second spike was at MSL Sol 469 when Mars was at Ls 56. That's 164° later in its orbit. The pressure then was 908 Pa which is 98.16% of what it was when the first spike was seen. The first spike occurred almost exactly when Mars was at perihelion at Ls 251 (closest approach to the sun) and in the late spring where MSL sits in the southern hemisphere. Summer in the Martian south begins at Ls 270. The second (908 Pa) spike at Ls 56 was in the southern hemisphere's fall season. Pressure at aphelion (Ls 71 when Mars was at it further point from the sun) was still 898 Pa, which is 97.29 % of its perihelion value of 923 Pa. If, as was once thought, both Martian poles were frozen carbon dioxide, we would not be surprised to see that a lander close to the equator showed two similar pressure spikes 180°apart, with each one reflecting frozen carbon dioxide at the summer pole sublimating and returning the gaseous state. However, we now know that there is very little frozen carbon dioxide at the North Pole. The ice there is mostly water ice. The frozen carbon dioxide is mostly in the Martian Antarctic (offset from the South Pole). We show throughout this site that all Martian air pressure data is suspect due, probably due to faulty pressure transducer design that did not allow for very tiny dust filters to clog with dust immediately upon touchdown. It is also possible that the data published by NASA is deliberate disinformation. We document several cases where JPL altered its MSL weather data AFTER seeing our criticism of it. The most recent such alteration is shown on Figure 2 below after Table 1. Figure 1 above summarizes MSL pressure data up through its Sol 866, Ls 270 - start of the second summer at MSL. colder than -89 has white with red. H Max pressure not revised until Sol 1160. Figure 2 Statement by Barry S. Roffman - Sol 829 shows how NASA/JPL altered data after Table 1 color-highlighted data that was off the expected curve. This pattern suggests that NASA is not always publishing real data. Rather it is publishing data in response to this web site. While this web site is maintained out of the City of Cape Canaveral, Florida, we have no formal relationship with NASA, although we would do HONEST work for them, Mars One, or any space program not hostile to the United States if asked to do so. WEATHER FOR MSL YEAR 2, STARTING WITH THE FIRST DAY OF ITS SECOND SUMMER (SOL 865, LS 270), IS FOUND HERE. FIGURE 4 - REMS RADICALLY REVISES (TRASHES) ALL ITS PRESSURE DATA AFTER 954 SOLS.